Ok, I have a little backlogblogging to do before I upload our Breckinridge Vacation, which was great, by the way. It all began with our fourth child, Timmy. 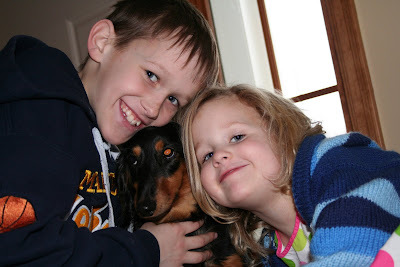 Timmy was barely through the birth canal when he looked us in the eye and asked for a dog. Pretty much! You know there are just some people out there who are "dog people," and although neither my husband Tim nor I are anywhere remotely near that category, through some genetic mutation, our little Timmy clearly is. He may have inherited it from Grandpa Dave, now that I think about it, but that's another entry...that's another whole blog site in fact. 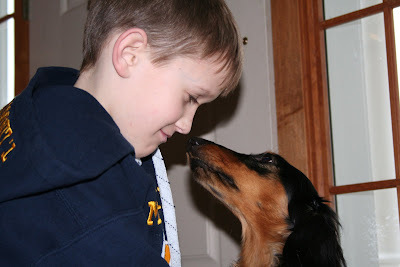 But the fact is, that he has loved dogs, any dog, since he was born. Sadly, "we" were completely inept at training Fisher. I was too busy trying to train my kids! And I'd never had a house dog...which is a very different thing than a "run around wherever" country dog such as those I'd grown up with. After struggling for a year and a half, we decided that, to save our sanity, our marriage, (not to mention our floors and our grass), we would try to find an adoptive family. God knew we were at the end of our rope, because he provided a miracle almost right away in the form of a dear lady in my book club group who amazingly agreed to adopt Fisher as a companion for their 13 year old yellow lab named Fenway! Fenway and Fisher...perfect don't you think? I did! He went from being the frustration of the family to the adored pet who got walks every day. (The only person in OUR family with the inclination to walk Fisher was little Timmy; but after one attempt it became clear that Fisher flew Timmy like a kite and to let them go off would be to never see either one again!!...) So Fisher went to live with his new (and better, I'll admit it) family. It was the completely right and appropriate and as I mentioned before marriage saving thing to do...except for one thing which we didn't realize until about two years later...it broke Timmy's heart. And oh he'll tell you how it broke his heart. He especially likes to do so on holidays and at dinner parties! Believe me, he can make a grown man cry with his story. He is now nine and is getting quite professional at it. In fact, this past winter he had his dad feeling so incredibly guilty that Tim was ready to do the ridiculous, the impossible, the please somebody just knock him unconscious before it's too late...to actually get another puppy for Timmy for Christmas! Gasp! I assure you, I wasn't going to let it happen!!! I threw myself across the proverbial train tracks on this one. It wasn't a hard case to argue, believe me. But Tim was in such throes of mesmerizing guilt that I had to resort to saying "dog poop...dog poop....dog poop..." over and over until the crazy light left his eyes and he came back, back to the universe we live in! All this leads to Frodo. Frodo is my friend Lisa's shorthaired dachtsund (spelling?). Here he is...isn't he cute? Sadly her grandmother passed away recently, and while we were so sorry for her loss, we were thrilled to dogsit Frodo while they were away at the funeral. And much to my delight, Timmy was ALL OVER IT! Here was a dog he could take for walks! He stood out in the yard for long stretches of time waiting for little Frodo to do his thing! (He tried playing football with Frodo, but that didn't work out so well...) But for the whole twenty four hours we had him, Frodo was Timmy's constant companion...or vice versa...they were so sweet together, and I didn't have to do anything...it was wonderful! 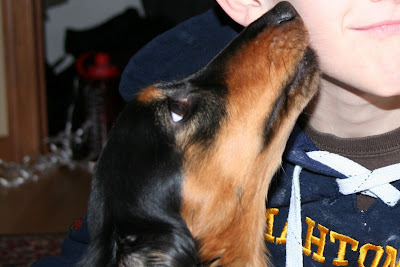 The licking was nonstop...eeek...but he truly loves it. Now in case any of you dog lovers out there are making plans to throw a brick through my window or anything, let me just say that Timmy sees Fisher on occasion and in fact just recently got a good all over bodywash from Fisher who is always ecstatic to see any of us, even Tim. (Go figure.) And he has been emotionally healed somewhat by the promise of a dog of his own in a few short years, not to mention the guilt leverage he now expertly holds, especially over his dad. And, although I hope it is under happier circumstances, I'm sure Lisa will loan us Frodo in the future and Timmy can get his dog fix that way. See? It all works out, Praise Be to God. The End. I have just realized that one of my true life goals is to share your ability to spin yarns that keep people hooked, laughing and hooting out loud, and able to hear, and I mean HEAR, the people say the things that are written. You are expert my friend :) When do I sign up for classes!? I won't tell Amanda, Mike...although I did just publish it on a public site....You two are sweet, but I think the reason that you can hear "the voice" in my writing is that you know us so well! But thanks all the same! I LOVE this post, except the thought that we're already talking about the big kids going to college. Oh Suz just so you know there is one in every family. 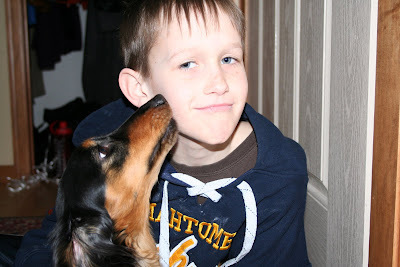 Our Timmy is Mattie he has wanted a dog forever.